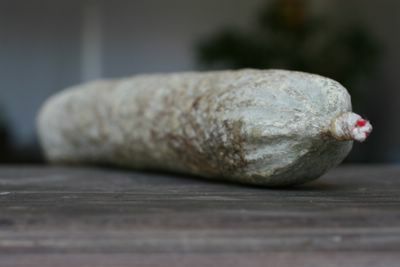 It's a Saucisson Sec from The Fatted Calf. I bought this at the Berkeley Farmer's Market just over a week ago. Fred is crazy for saucisson sec. When I first met him, he talked about it for a whole year until we eventually went to Paris together so I could actually see what all the fuss was about. To no avail, we have been trying to source Le Saucisson Sec in California for the longest time. Imports of the sausage are banned, so it's not easy to find. The first time we saw it listed as one of the weekly specials, on Meathenge at the end of 2004, we rushed to Berkeley only to find that the Fatted Calf had already sold out. I immediately signed up for the Fatted Calf newsletter and have been scanning it religiously ever since. As soon as I saw the Saucisson Sec back on their product list I rushed over to Berkeley to buy one for Fred. Why then, a week later, the Saucisson is still lying there unopened, you might be wondering? Well Sec translates as dry. Fred and every Frenchman who has dropped by our place in the last week, has prodded the sausage and declared it to not be sec enough, yet. I assume it will miraculously attain the correct level of dryness in the following week, whilst I am away in England so that by the time I return, next Sunday, there will be no Saucisson Sec left to try. All bets are on - do you think Fred is going to save me any of his special sausage to enjoy and savour on my return? I also discovered that Trois Petits Cochons, a company in New York, make saucisson sec. Unfortunately they only sell it online as part of their Backpack Through Provence. I don't know about Fred, but I don't want to amass a collection of little purple backpacks, just for the sake of a saucisson sec. When I met with the 3 Little Pig people at the Fancy Food show recently, I asked if they sold any locally. They were a bit hazy but they told me they thought that the Cheese Shop on 24th might sell it. I haven't had a chance to check this out yet. If anyone out there has seen it in the Bay Area, anywhere at all, please let us know. Lovely saucisson! Have a fabulous trip, Sam! Hmmm. With the Bay Area weather so humid it may never acheive the proper degree of sec-ness without professional help. Best to send it to me for some additional drying. No guarantee I'll send it back though. Have a safe and wonderful trip! I'm looking so very forward to your posts on English foods when you come back! Haddock - You'll have to visit the fatted calf on your next trip down here.